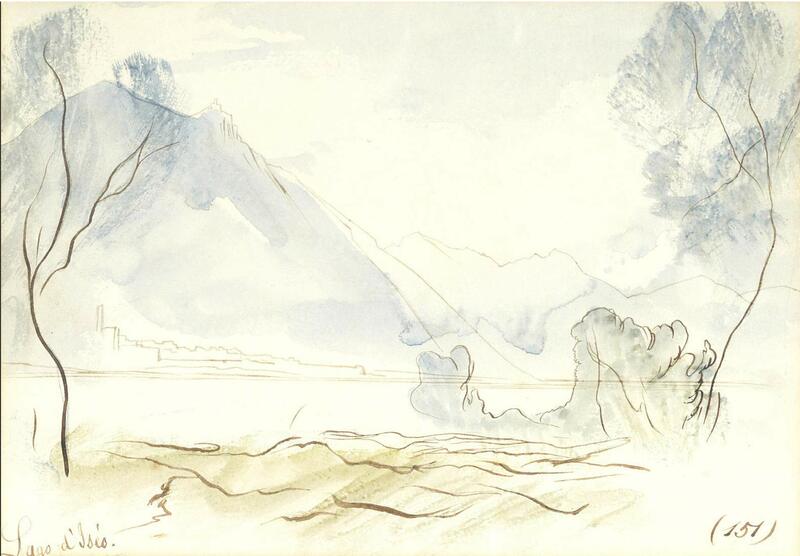 Edward Lear, Lago d’Iséo, Lombardy, Italy. Inscribed with the title (lower left), numbered ‘151’ (lower right) and bears the John Peter Cochrance collection stamp (on the mount inside, lower left). Brown ink and watercolour. 16.5 x 22.8cm (6 1/2 x 9in). Following an extensive trip to the Holy Land in 1867 Lear headed to Lombardy in Northern Italy and spent a month travelling through the Italian lakes. This small study most likely dates from the end of May 1867. Bonhams (where it is mistitled “Lago d’Isles”).